The E.G.G. 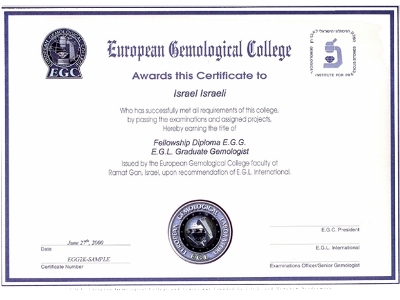 diploma is considered the highest gemological title available in campuses in Israel. The title is a status symbol in the diamond industry, highlighting its bearers as highly knowledgeable gemologists. With the reputable certification in hand, some of the E.G.G. diploma graduates are functioning as key figures in leading positions throughout the world gem trade pipeline. Since 2014, E.G.L. College offers its graduates to be listed in its published college records. Below is the list of E.G.G. graduates of E.G.L. College, arranged according to the date of graduation. If you are an E.G.G. graduate and would like to have your name removed, please contact us.